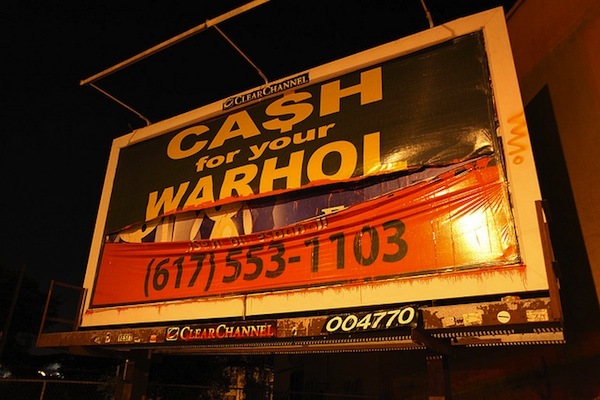 For years, I’ve followed the saga of Cash For Your Warhol, the Boston-based art experiment that’s been bugging art collectors, confusing the general public, and entertaining the street art world for years. 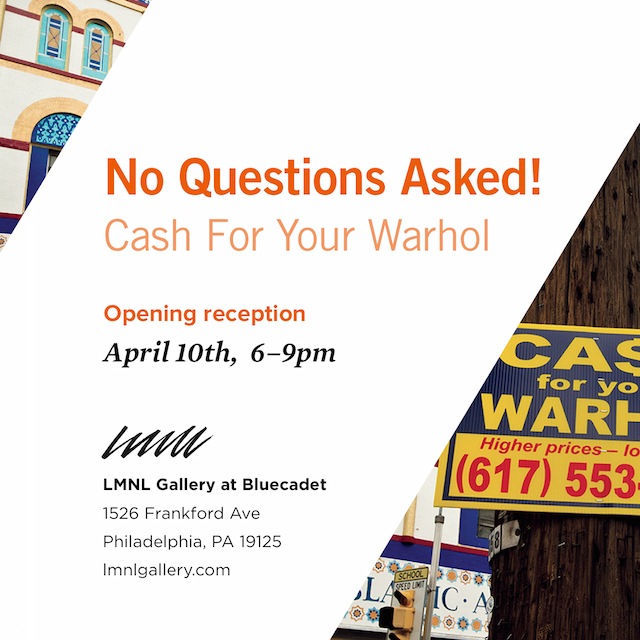 Now, Cash For Your Warhol is coming to Philadelphia with a show at LMNL Gallery, where I’ve been curating shows since last fall. No Questions Asked! opens at LMNL on April 10th. Cash For Your Warhol is the brainchild of artist and photographer Geoff Hargadon. The project began in 2009 in response to the financial crisis, and to an art market that treats paintings and sculptures as investible assets similar to real estate and gold. 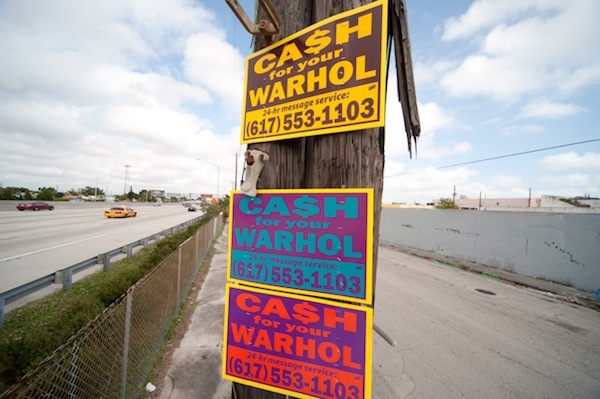 Through stickers, stencils, plastic signs, and billboards, Cash For Your Warhol has been a subtly hilarious part of the urban landscape and the art market for over half a decade. In 2012, the Andy Warhol Museum in Pittsburgh even added a few of the signs to its permanent collection. The Cash For Your Warhol project is such a simple and effective critique of art market and financial industry absurdity. From the moment I first saw the signs, I was hooked. The project is even more fascinating now that you can find Cash For Your Warhol art in galleries. That’s something I love, but I never expected. With No Questions Asked!, it’s all come full circle in a perfectly surreal way. Plus, it’s an opportunity to exhibit some of Hargo’s photos, and he is one of the best street art photographers active today. No Questions Asked! 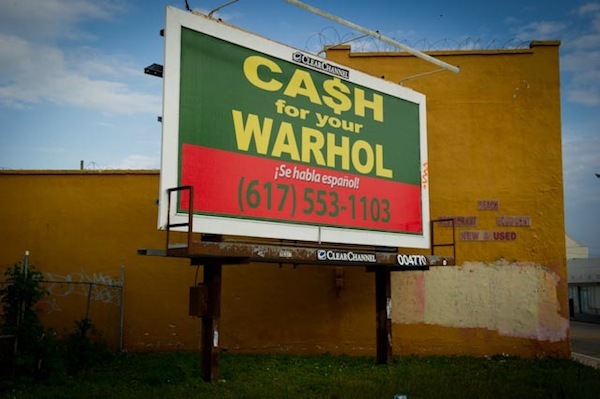 will be Cash For Your Warhol’s first exhibition in Philadelphia. The Cash For Your Warhol team did, however, visit earlier this year to install work around the city. The exhibition will include photographs from that visit, an interactive sculpture, and the complete collection of the 24 Cash For Your Warhol signs created since 2009. As the opening of No Questions Asked! approaches, keep your eyes out for CFYW to make its message heard in Philadelphia in a big way. 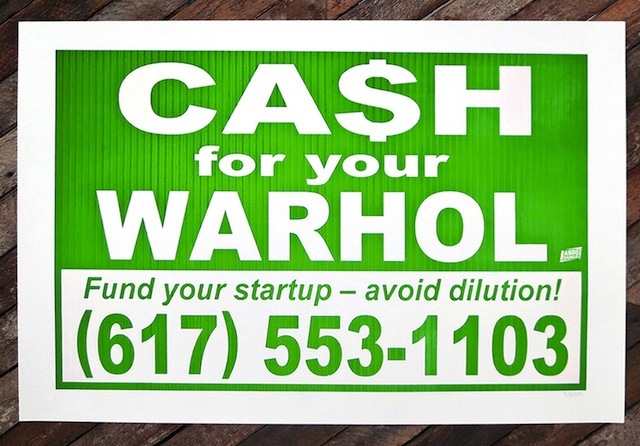 In the meantime, remember to dial (617) 553-1103 for all your Warhol-selling needs. See you at the opening on April 10th! Geoff Hargadon of Cash For Your Warhol fame has a show of new work open now at Gallery Kayafas in Boston. I love Geoff and his work, so it’s great to see him take things further and introduce totally new work with this show, Warhol Coming Soon. You can head over to The Boston Globe to read about some of the new directions that are introduced in this show, because I want to focus on how the Cash For Your Warhol project is being extended. 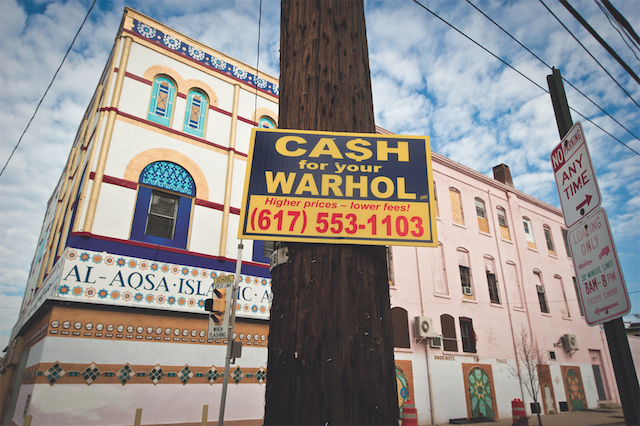 In case you’re unfamiliar, here’s how Cash For Your Warhol works: For years, Geoff has been placing signs and stickers around the country with the phrase “Cash For Your Warhol” followed by a phone number. The signs emulate the CASH FOR GOLD or CASH FOR YOUR HOUSE signs that are so ubiquitous on telephone poles across the USA. 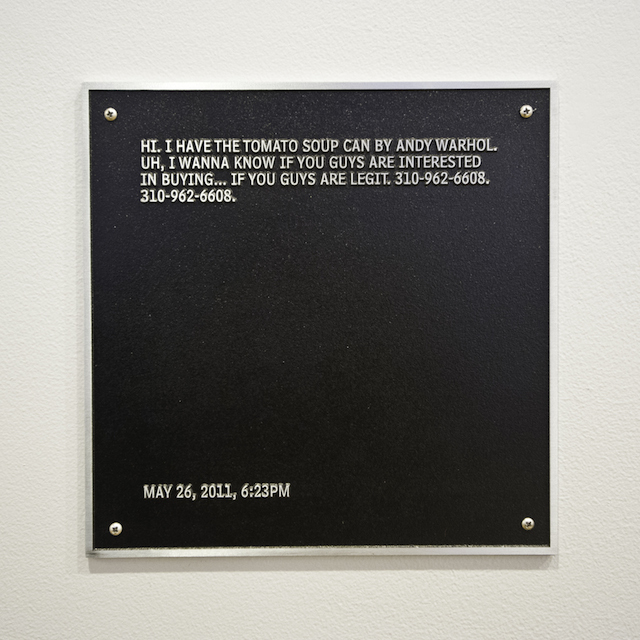 People really have called up that phone number, some to complain or ask what the hell the sign is about, and other to try and sell their Warhol’s. 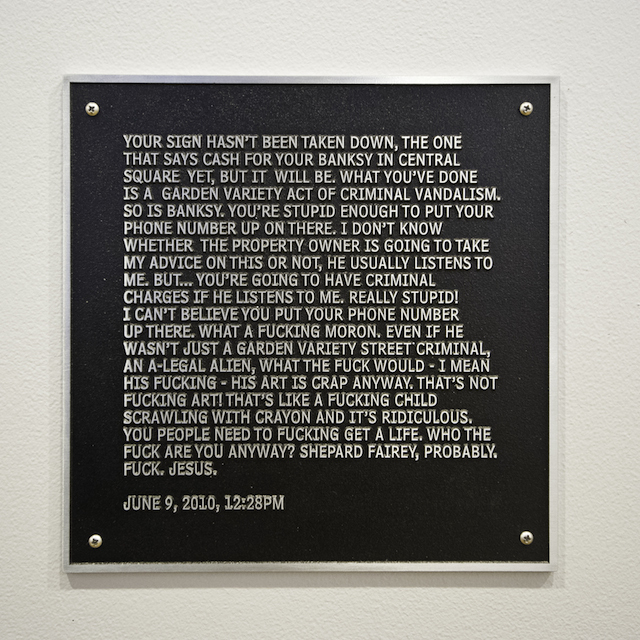 For this show, Geoff has transcribed some of the best voicemails of the Cash For Your Warhol inbox and made them into wall plaque sculptures like something Jenny Holzer might produce. Street artists don’t always have great opportunities for feedback on their work, and of course even gallery artists have limited opportunities for feedback because honest responses are just hard to come by, but Geoff doesn’t have that problem. 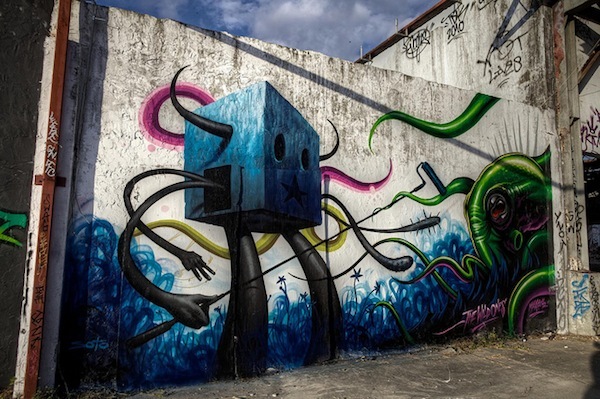 In the street art world, I think many of us like to believe that most street art improves streets and that people love it. And that may often be the case, but sometimes it pisses people off or just confuses them. 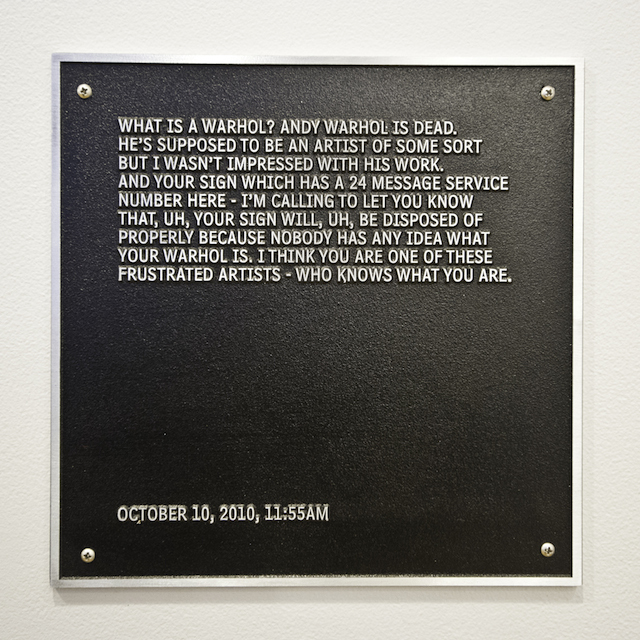 In what I imagine was an unintended consequence of the Cash For Your Warhol Project, these plaques give a bit of insight into the complex relationship that street art has with the general public. And of course, there’s also signs of the project’s impetus: A depressed economy and the transformation of art into a luxury good and an investment opportunity. So yeah, I’m really digging these plaques. You can see them yourself in person at Gallery Kayafas in Boston at Geoff Hargadon’s show Warhol Coming Soon, open now through March 1st. In her ongoing effort, since 2007, to revitalize the suburb of North Braddock, Pennsylvania, Swoon has recently launched a print shop Braddock Tiles. 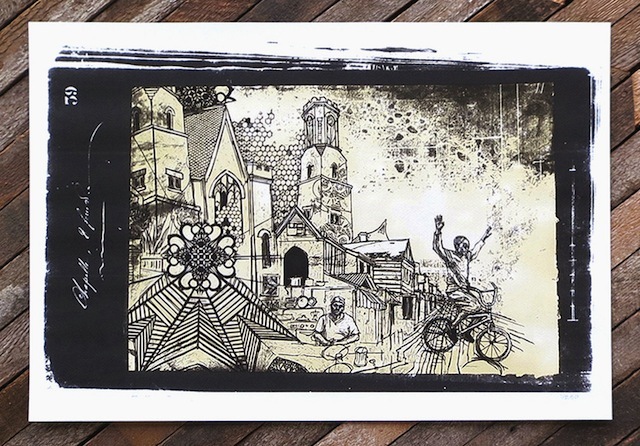 Through creating and selling prints of images donated by 50 artists, Swoon is trying to raise funds for the construction of a new roof for the town’s community center made of 20,000 handmade, honeycomb-shaped, ceramic tiles. 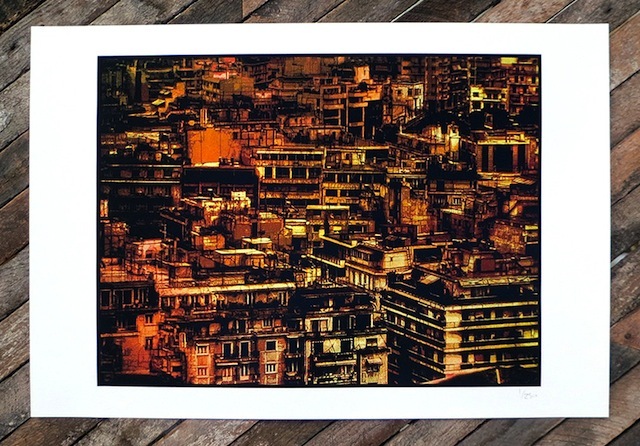 The prints are priced at a reasonable $45 and each at an edition size of 250. Definitely worth the purchase, in my opinion. 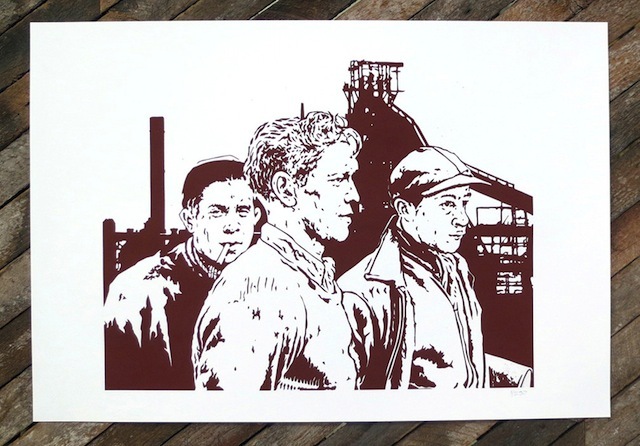 You can have a look at the collection of prints here. Fourthwall Project in Boston has put together a show with LNY, Radical!, Tiptoe, Nanook, The Phantom, Geoff Hargadon, Zatara and Blackmath. 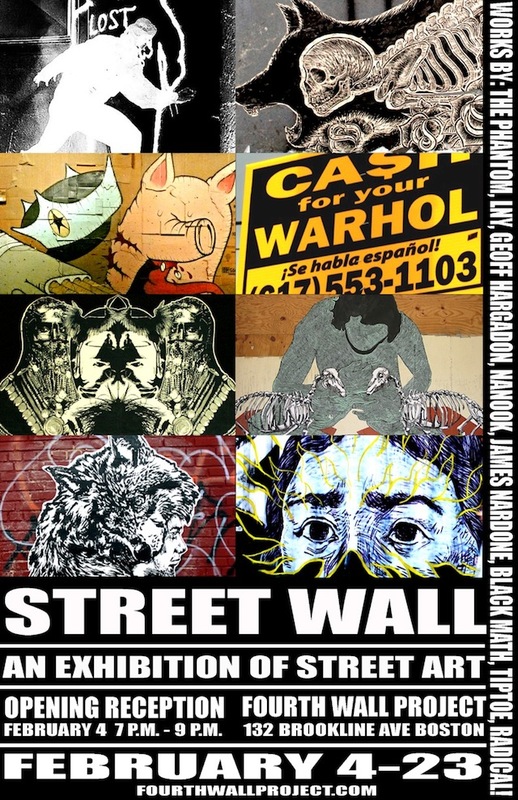 Each artist in Street Wall will wheatpaste their work onto the gallery walls. Although the artist line up is great, the concept is the sort of thing that could really go either way and it’s impossible to say for certain. Hopefully it works out. 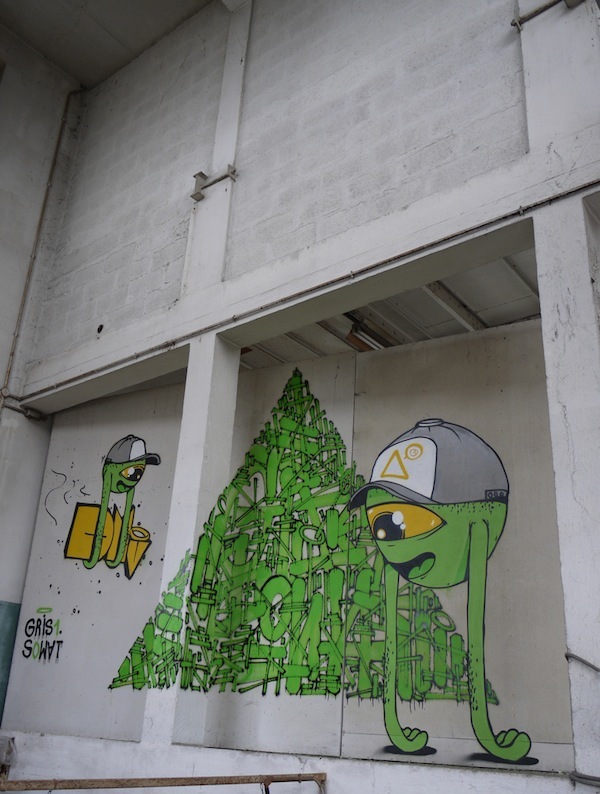 Some thoughts from Alone One on graffiti and street art coexisting (and the inherent superiority of graffiti, according to the author). While I agree with the author that, in the case pictured, Aakash Nihilani and Posterboy did the smart and respectful thing by utilizing a piece of graffiti in their street art rather than covering it unnecessarily, the all-to-common argument that graffiti is always always always superior to street art really upsets me. 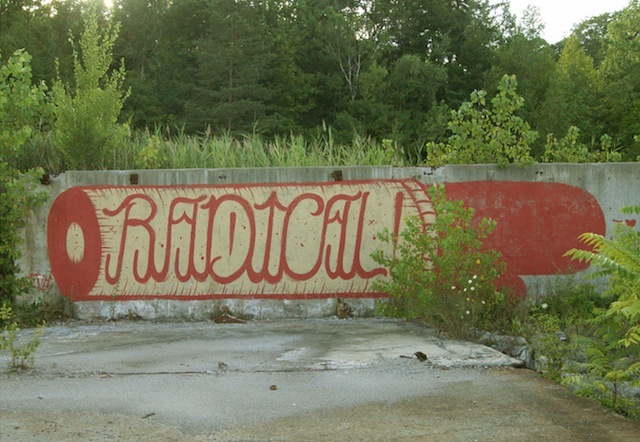 Is there something beautiful/powerful about a tag that street art cannot capture? Sure. 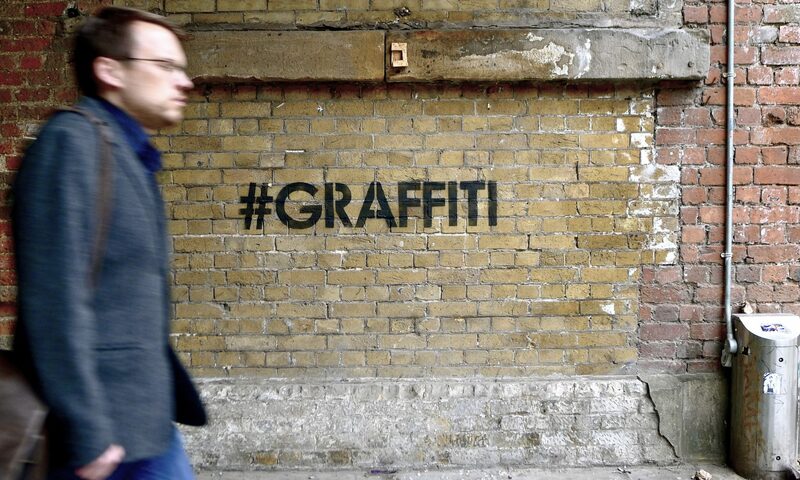 Are there street artists (and young graffiti writers) who stupidly go over important graffiti? Definitely, all the time. 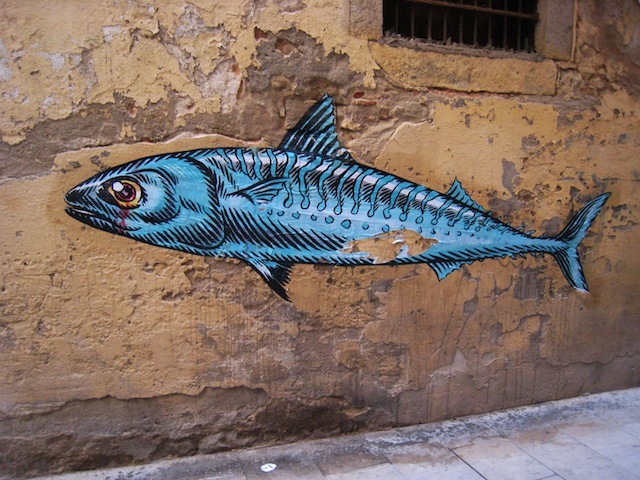 But warning that street artists can never go over graffiti under any circumstances is narrow-minded and naive, especially today when so much work blurs the line between street art and graffiti. It’s too bad when such a talented writer has such a narrow view of things. 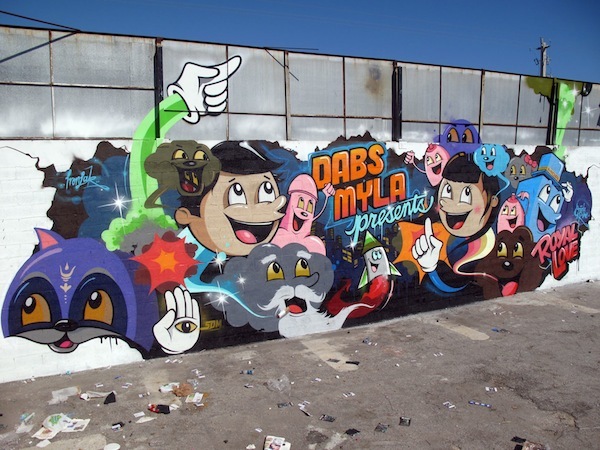 Here’s the latest work by Dal. Evol never fails to impress. 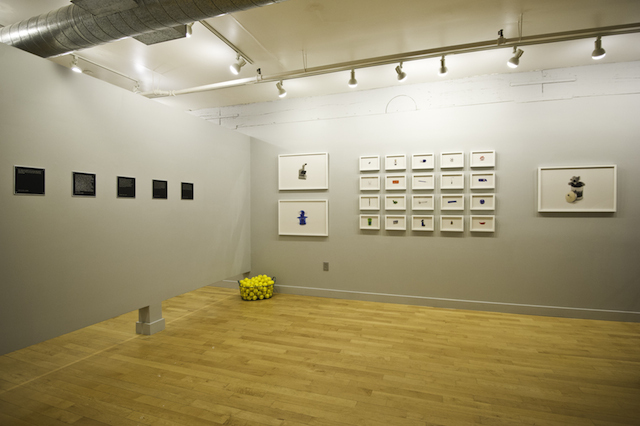 MOMO is part of a show on at Space 1026 in Philadelphia and made this sculpture. Os Gêmeos have a show opening next week at the Museu Vale in Vila Velha, Brazil. Here’s a bit of a preview. Some stunning walls were painted at Meeting of Styles London this year, particularly by Shok1. S.Butterfly has a set of images from the Moniker fair. I’d like to hear in the comments what people who were there in the flesh thought, but it looks to me like a bit of brilliance (Dabs/Myla, Matt Small), a bit of goodness (Cash For Your Warhol, Aiko) and then a massive logo from D*Face and Scream Gallery’s booth which both just make me want to scream in a bad way (although I think D*Face’s piece actually looked a lot better once someone tried to mess it up and he had to change the piece to this). Update: It’s actually unclear if that simple D*face Ddog logo was intended to stay that simple or if the additions were part of the plan all along given this piece inside the fair. 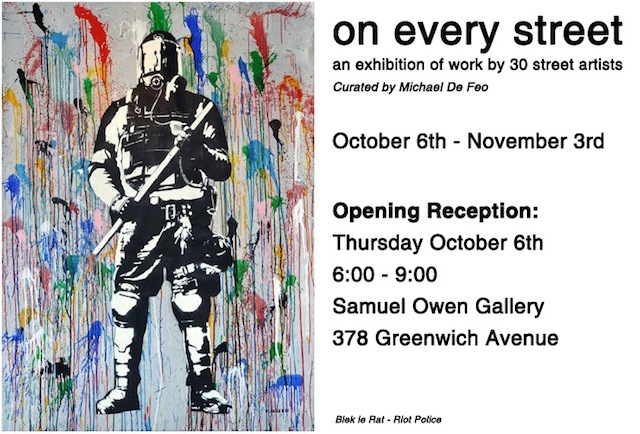 On Every Street is a show opening this Thursday at Samuel Owen Gallery in Greenwich, CT. Curated by Michael de Feo, it features the work of dozens of street artists. On Every Street includes a diverse of street artists both in style and (from Hargo to Tony Curanaj) and when they were active outdoors (from Richard Hambleton to Gaia). Here’s the full line up: Above, Aiko, Michael Anderson, Banksy, Jean-Michel Basquiat, C215, Tony Curanaj, Michael De Feo, D*Face, Ellis Gallagher, Keith Haring, Ron English, Blek le rat, Faile, Shepard Fairey, John Fekner, JMR, Gaia, Richard Hambleton, Hargo, Maya Hayuk, Don Leicht, Tom Otterness, Lady Pink, Lister, Ripo, Mike Sajnoski, Jeff Soto, Chris Stain, Swoon, Thundercut, Dan Witz. The Underdogs‘ book is available online. 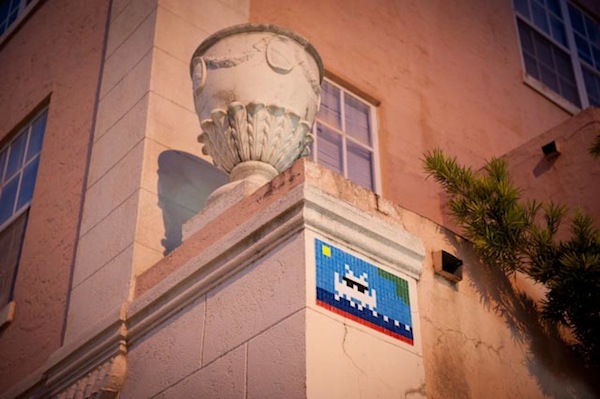 The Portuguese collective features artists like Vhils and Tosco. JR has a book coming out with Drago towards the end of April. José Parlá has a solo show in NYC opening in March. These works from Yola in Poland remind me of John Ahearn’s sculptures. And actually, this new sculpture from Leon Reid IV (aka Darius) kind of reminds me of Ahearn as well. Amazing video of the 1UP crew in Berlin. Just watch. Sorry I’m late on this one, but the latest Cash For Your Warhol print has already sold out. NohJColey put up an interactive sculpture (and there’s this one too). PosterBoy recently posted this photo on his flickr. It’s described as a “collaboration” with Hargo, who does the Cash For Your Warhol billboards and signs. Besides reminding me of Specter‘s sidebusts, it brings up some interesting questions. Like a lot of work that critiques advertising and a capitalist art world, Cash For Your Warhol’s work seems to have become, to a small community, an advertisement for the art as much as a critique of the art world. While I like what Hargo does, I think there’s also a lot of value in PosterBoy modifying the billboard. Jordan Seiler, someone I consider an authority on this subject, has said that the best advertising takeovers are those where there are no identifying features to turn the disruption into an ad of its own, and Hargo’s work certainly doesn’t fallow those rules. Nonetheless, the vast majority of art-fair visitors who say the above billboard outside of Scope this year in Miami would have had no idea about Hargo and not seen the work as advertising. And of course, I could be misinterpreting this and PosterBoy could essentially be agreeing with Hargo’s sentiment about the absurdity of the art market by ripping apart the billboard as if it were a real ad promoting a sort of Warhol pawn shop. Here’s a hodge-podge of photos of some of my favorite murals from Miami this year… Probably more to come in future posts as well. Most of these were part of Primary Flight. With so much of the art world migrating to Miami this week in a frenzy, there seem to be too many events and parties (and I promise not to blog about the parties in detail. This isn’t a gossip site) and exhibits and festivals and everything else to keep track of. Here’s a roundup of some of the things that I’m most interested in seeing (or not seeing). This year’s Primary Flight mural project has an impressive list of artists including Roa, Escif, Retna and Boxi. 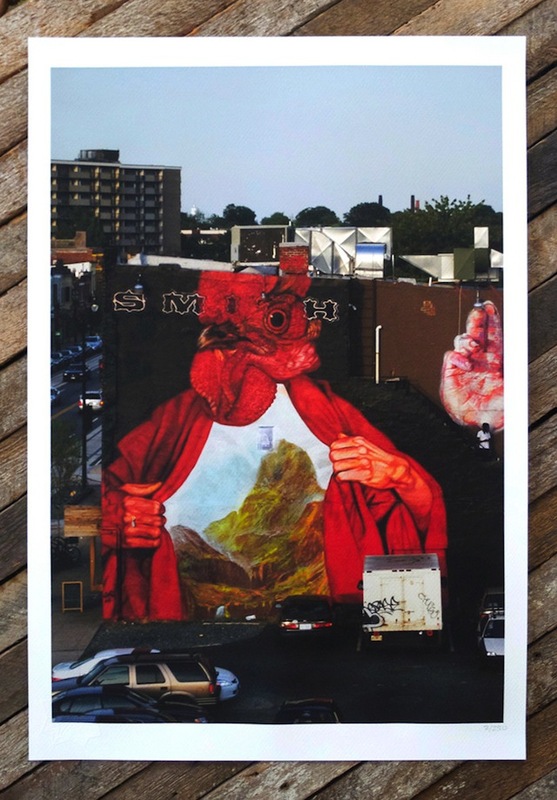 Fresh Produce looks to be a solid group show of graffiti and street artists. There will be some new Cash For Your Warhol billboards. Retna has a solo show at the new Primary Projects space. 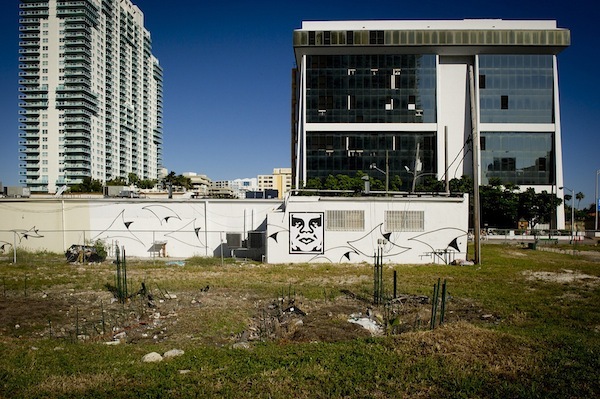 Wynwood Walls is a mural project (among other things) with some big-name artists but questionable motives. Elisa Carmichael has her list of Miami must-sees, which includes a Dan Witz book signing and a Trespass book signing with Marc and Sara from Wooster Collective and Carlo McCormick. Sorry to bring this up, but Sanrio’s exhibition of Hello Kitty art is just annoying. They got some great artists like Jim Houser to paint Hello Kitty characters. I’ll be avoiding this show like the plague. I mostly go for Ryan McGinness’ really abstract work and this isn’t that, but McGinness fans will probably want to check out his solo show. 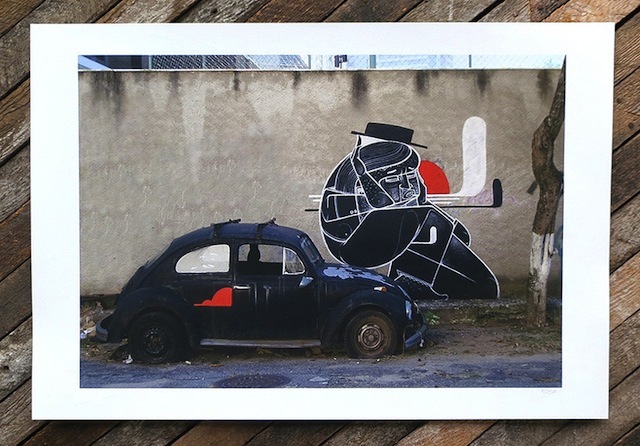 Barry McGee will be showing work and signing books at Ratio 3’s book in Basel Miami. 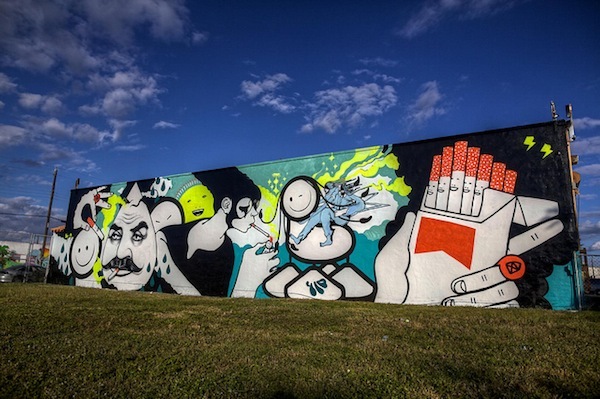 Jonathan LeVine Gallery has a pop-up show as part of Wynwood Walls. 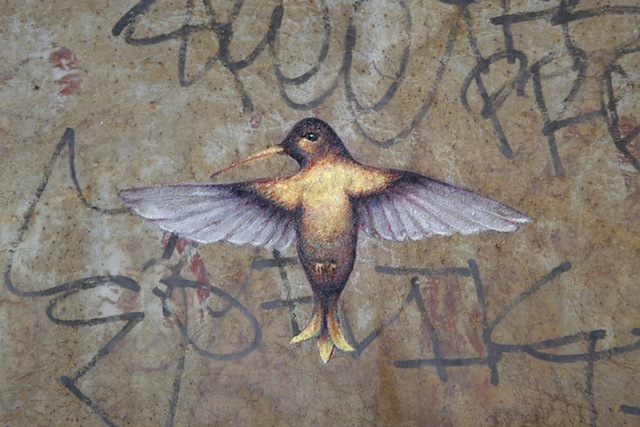 Some of the artists include AJ Fosik, Judith Supine, Doze Green, Dan Witz and WK Interact. FriendsWithYou are filling a park with giant blow-up sculptures. Last year, OHWOW Gallery’s It Ain’t Fair show was one of the most interesting shows in Miami. 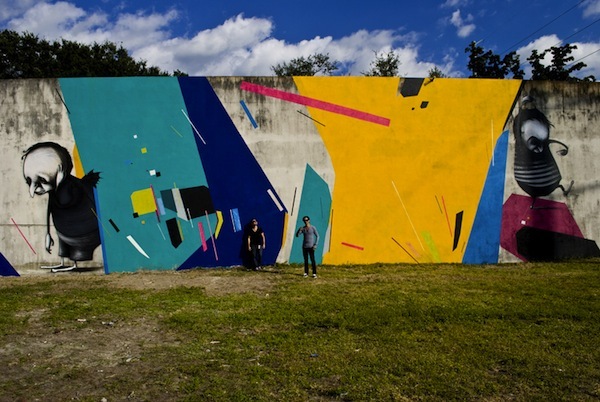 Once again, they have a killer line up for the show including José Parlá, Rey Parlá (José’s brother who is, I believe, a filmmaker), KAWS, Phil Frost, Barry McGee and Neckface. OHWOW Gallery are also opening a bookstore at The Standard Hotel in Miami. 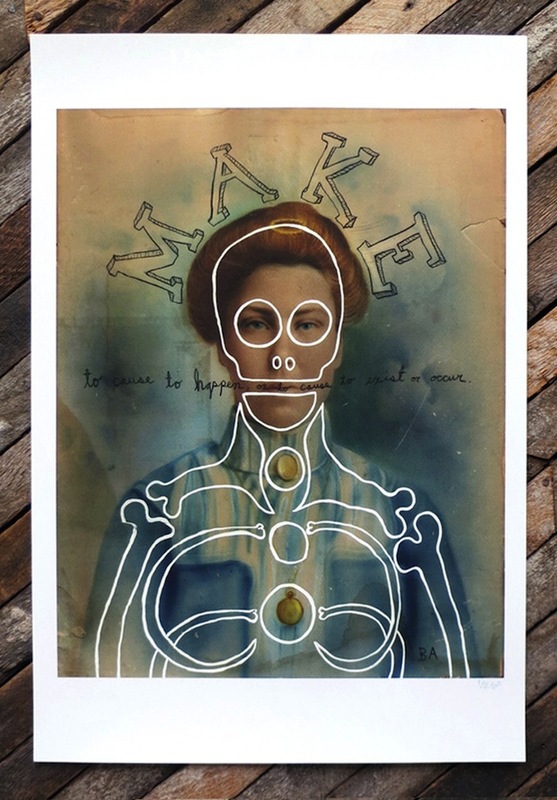 New Image Art’s pop-up show includes Neckface, Judith Supine and Os Gêmeos. Probably going to be a must-see. Tristan Eaton and his partners are launching Contra Projects with a wide-array of events this week including a tent/lounge space, a mural (by Mr. Jago, Tristan Eaton, Ron English and others) and a TrustoCorp carnival aka TrustoLand. More info on the Thunderdog blog. Carmichael Gallery, Joshua Liner Gallery and others will have booths at SCOPE, and I think Maya Hayuk is painting a mural there, which should be awesome if I’m remembering that correctly. And of course there’s all the fairs I haven’t mentioned, because there are just so many. So many. Too many. It’s gonna be art overload. But if I’ve missed anything that you think is particularly special, please leave a comment.